To keep everything neat and tidy in the garden, it helps to have a sturdy border around the beds. 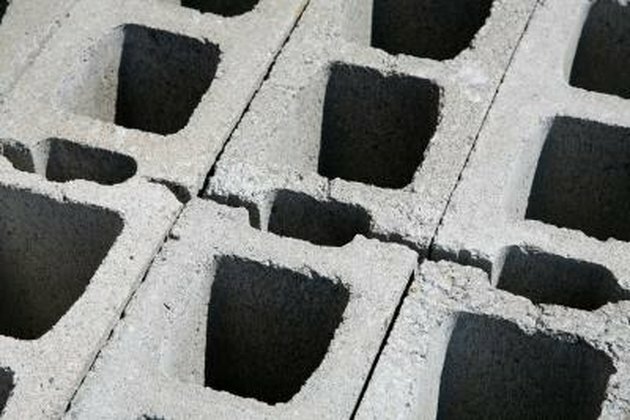 Cement is durable, inexpensive and easy to work with and if you use ordinary cement blocks -- sometimes called cinder blocks -- you get a bonus plant pocket every 8 inches as well. Plant the cells using quality compost or potting soil just as you would with a pot, and create a clever herb or flower garden to decorate your mini border wall. Ordinary cement blocks make good walls with plantable "pots" built in. Drive two stakes in the ground with a hammer at each end of the area where you want to create a block border. Stretch a string between the two stakes and adjust one end of the string to the desired finish height using a tape measure. Attach a line level in the middle of the string and adjust the other end of the string until the level indicator bubble rests perfectly in the center of the level. Measure 9 to 10 inches to the outside edge of the bed from the string and use a chalk line to mark a line parallel with the string along the entire length. The space between string and chalk line marks the width of the block border plus an inch or two of work room. Dig a trench between chalk line and string to a depth of at least 6 inches -- measured down from the string. Dig somewhat deeper if you live in a very cold climate where the ground regularly freezes solid below that depth. Note that with deeper trenches, you may need to use two or more stacked blocks to raise the wall to the string height. Pour 3 inches of gravel in the trench and tamp down firmly using a tamper or improvised tool. Spread another 3 inches of sand in the trench atop the gravel and tamp firmly as before. Measure from the string to the surface of the sand at intervals along the trench and adjust the sand level to maintain accurate depths throughout. Set one cement block -- holes facing up -- in the end of the trench and tap it down firmly with your rubber or wooden mallet. Place a second block next to the first in the trench and tap into position as before. Set a carpenter's level across the blocks and tap one or the other until both sit level with one another. Continue setting and tapping blocks into place and checking for level along the trench until all the blocks are in place and you have a complete low border wall. Measure the gap -- if any -- from the top of your border wall to the string. If the blocks rise to within an inch or two of the desired height, backfill the edges of the trench with soil to finish. If they sit well below the desired height and you want to add another row of blocks continue to the next step. Lay a bead of masonry adhesive along the tops of two or three blocks at a time, using a caulk gun to apply it. Set one half block directly over the last full block in the row beneath and align the end and sides. Tap in place firmly to seat it. Starting with a half block ensures the correct "one over two" masonry pattern for greatest wall stability and strength. 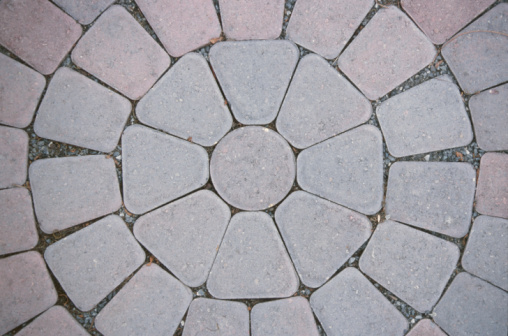 Place a full block next to the half block and align and seat as before. Continue setting blocks to the end, finishing with a second half block. Fill the block's holes with compost or soil and plant to finish. Low-growing plants like creeping thyme, moss roses or strawberries work well and will not grow high enough to shade or otherwise interfere with garden plants.